Such an easy, yet chic look! I'm loving your sleeveless trench with the stripe shirt! You look lovely! Love black and white! Such a cute look Trang! I have an army green vest similar that I wear all the time, so easy and chic! I love this look! 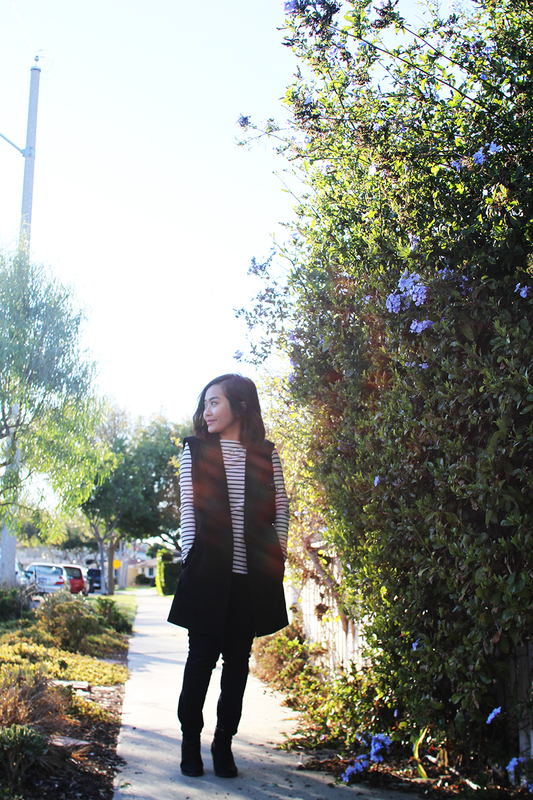 The vest with the stripe shirt is such a perfect combination! I don't think you can go wrong with this kind of look. So classic, especially the striped shirt. I love love love this look its so cute and casual! You are far from basic my dear you are stunning.... loving this whole look! A combination of basics can really elevate your look! Your outfit is so effortless! What a great and simple look. Looks fantastic. Such a cool basic outfit. I find myself playing around with the basics also! Very chic! Cool look. Like your vest. Love this look! Great classic stripes! Love this look, and that bag is perfect with it!! Great look, I love how all the pieces pair so well together, you look lovely. I love the way you could pull off the vest! I'm short and I feel like sometimes it just makes me feel disproportionate. I love wearing basics. Great outfit! That vest is so chic! Basic always works and this is particularly the best season to be lacking colors, love this OOTD, xoxo BING. I like basis! Dont you think that a black&white striped sweater always looks stylish? Whatever you wear underneath. I like that sleeveless Trench. Very on trend. Love mixing basics with cool stuff during winters! U look so chic! Beautiful look. I like your strips top. What a cute look! I am loving the striped top and sleeveless trench combo! Love this black and white look! Such a great way to style basics and love that vest! You look so pretty I love the vest! Love a good basic look! Really, really pretty! Love the look! The length of the vest off the stripe top is magic. Oh, the stripes and vest make a chic combination. You look fabulous my dear! I agree, in the winter you can mix and matched and layer your basics to create so many cute outfits! I love this look and really want to get a long black vest! I always go for monochromatic looks in the winter! I love how you incorporated stripes in this outfit, and that duster is great. This look is right up my alley. I really really love it. Well done! I feel like I always use basic wardrobe! :') But one thing I noticed is that on winter I tend to use more dark colors and I'm trying to change that. But I can totally agree with you, basic rules! Winter is absolutely the time for basics, I practically live in my turtlenecks. This outfit is so cute dear! 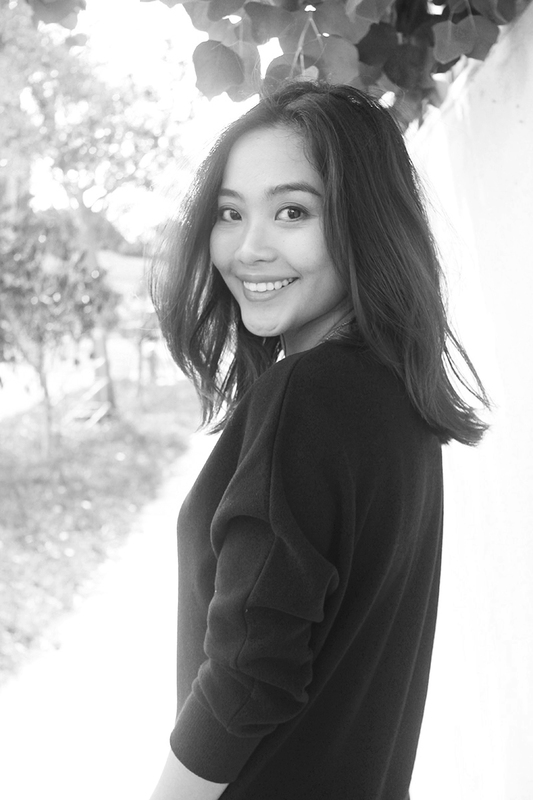 Very chic and awesome smile. Thanks for sharing and happy holidays! Love the look! Everyday basics are the bomb. Love it. Stripes and black clothing is a classic. I really love this look! so chic and classic! Love this all black look! Can't go wrong ;) Happy holidays lovely! Great look, always love stripes. Love your black and white outfit! So stylish! Love this outfit, especially since it's so simple but cute! I know you said the booties from Target were old, but they're really cute. Wish I could get my hands on them haha. I will be looking for that vest though, it seems like such staple (and versatile) item! What a gorgeous winter look! Absolutely love your vest! I like this classic outfit because I would wear it too! Your color combination is amazing and your bag which bring you perfect. I agree, basic and effortless this time of year is exactly how I dress as well! Love this outfit! I definitely turn to basics much more in winter. Black and White Stripes...a go-to basic! Love it! Like the combo with the vest and the striped shirt! Such a great bag! love it! this is such a classic, cute look! I have a few pieces like these in my closet-will have to try it out! I agree with the basics concept :) Nice post! I couldn't agree with you more! I'm always pulling out my turtlenecks, vest, and booties for many more months. Loving how u styled this outfit by adding a striped shirt. Hope u have an awesome weekend! I love the turtleneck. This outfit is really cute. So adorable! Love the stripes and that vest is so fun! I agree that all these basic pieces do look very chic. I love this outfit on you. It looks so effortlessly chic! I love your outfit and style, so beautiful! I love this outfit and the lighting in your pics is amazing!! Love the vest with the stripes. I am all about basics that make a statement. Love the outfit.. less is more.. I agree, basic pieces are so versatile and stands out on their own. You look so gorgeous! I'm such a basic girl myself :) I love black skinny jeans and black boots :) My go to look. You look so cool and this top is lovely! You look very pretty! Love how effortless it looks! I agree, Trang, I too tend to utilize the essentials in my wardrobe most come winter! 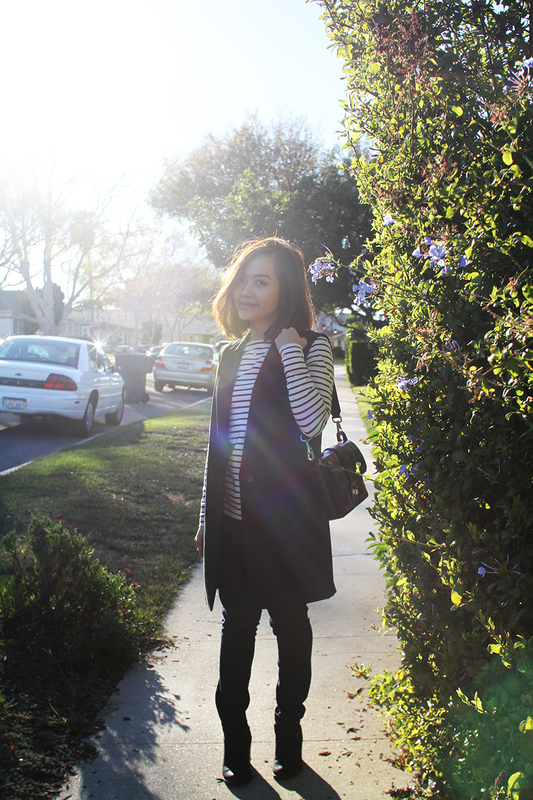 I'm loving your look here with the stripe shirt and black long vest, super chic! I hope you're having a lovely day and start to your week, beauty! I agree simple basics are a great way to look stylish in the colder months. Love you hair cut too! I love basics, you can really layer this to create awesome looks like this one! Perfect basics, love your vest! I agree, basics are the way to go! I usually try and throw in one trendy thing to make the outfit interesting! yes, yes CLASSIC is best! I adore the vest with the striped tee! Wow I love this outfit! And pictures are so beautiful! I love the trench, it's so cool yet basic! I would love to own one myself, but I don't find any that suits my body type and that doesn't break the bank! looking super pretty in this outfit! I agree. Winter is the best time make basic items look oh so fashionable! Gorgeous outfit. You can't go wrong with stripes and black. Trang, you look so sleek and chic in this minimalist look! 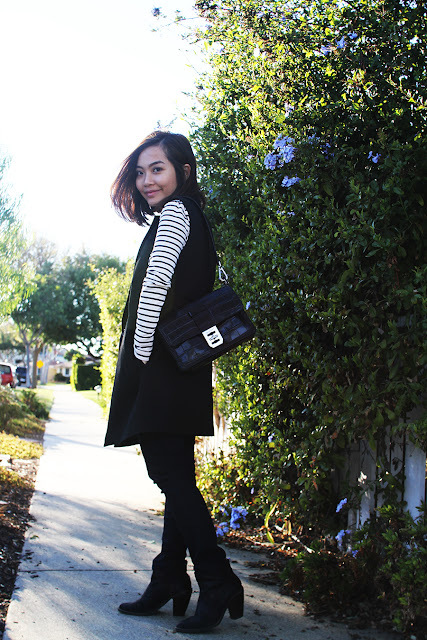 Love your bag and how you kept things monotone other than your striped shirt! Very pretty! Hope your week is off to a great start! Love this look! 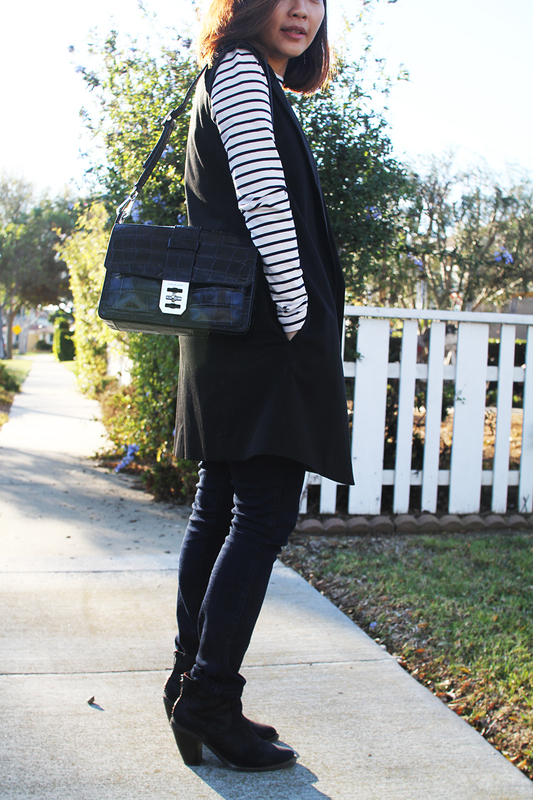 The stripes with the oversized vest is perfection! Soooo cute! Love basics during the winter times, they make for such fun combinations. I already followed yours cause it's amazing. Black and white is such a classic color combo and one of my favorites! Gorgeous! I'm loving the cute striped top too! I am such a fan of black and white! And this "basic" combo is anything but basic! Perfectly styled! I too find winter to be the most playful and adventurous time of year in terms of fashion for me. During the summer months it's all about keeping cool. I concur...back to the basics...cheers to a simple yet full life. Lovely outfit! I love your blog! Great job, Trang! Love this look!Such a great combination! Basic but so chic - Wishing you all the best in 2016! What a beautiful outfit! I love the vest over the striped shirt. Simple and classic. What a cute look! I love the vest, it completes the whole look. 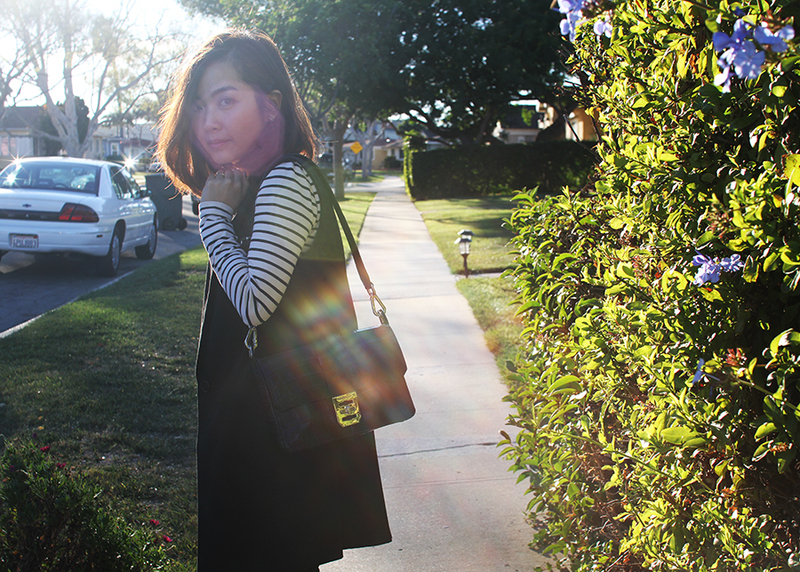 Lovin' the stripes and MK bag! Happy New Year! I love your blog! Just discovered it today. :) Happy New Year!!! Love your basic look! HNY~! "Everything should be basic" is also what I'm following. I love your striped shirt together with the vest! These are such original goals ! I agree with a basic thought. Adore that outfit of yours, so simple and chic. I love this look and this is what I love- I live for simplicity and elegance in everything!!! Cool combination! I like this style! And I like these sunny photos!